Enough of these MGM talkies! It's time to dip deeper into the past and into the heart of Keaton's greatest work. 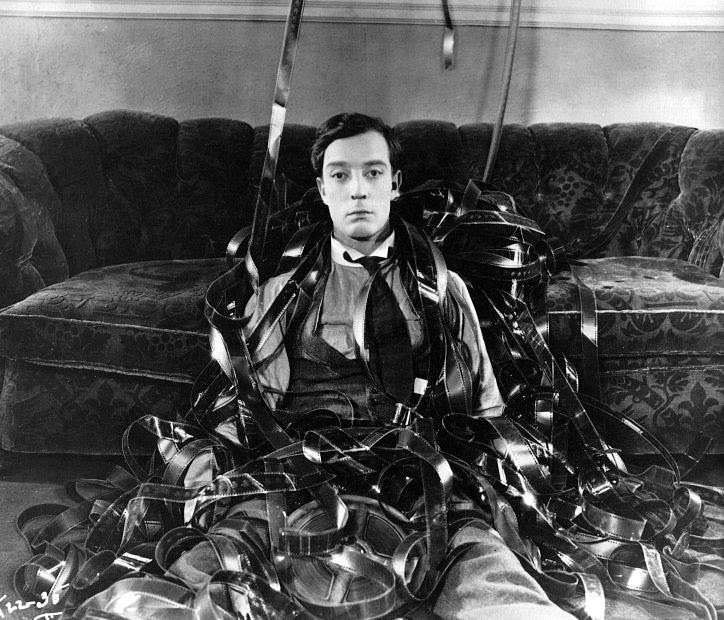 To kick that off, I'll share with you my very first impressions of the first movie Buster Keaton film I ever saw. Two years ago I knew nothing about Keaton other than that he was a comedian of the silent era. We watched Sherlock Jr. because in my family we were sampling classic films of all eras in order to embark on a journey through cinematic history. I had researched and included all of the best films, actors and directors that we could get our hands on and luckily I knew just enough to think we should include a Keaton work in our project. This title came up again and again while researching and it looked like it would hold the interest of my pre-teens and amuse us all. Boy was I right! For me, this film began a love affair with Keaton that will endure. I remember that even after writing this, the film continued to simmer in my mind for a long time; I had to learn more . . . about him, about the special effects, about the locations. And then I had to watch it again. Though I notice that with all really amazing cinema, the full effect is not really felt right after watching; rather, the work stays with you -- you think of them the next day and the next, they sink in and work their magic for days or weeks. . . . In my case, Keaton started taking over my brain cells and I couldn't wait to watch more, which I did, ravenously, until I'd exhausted his catalog of independent work. Soon watching wasn't enough, I had to write too. I may know a great deal more now, then I did when I wrote this post, but I cherish this "first time" :) and that awesome promise of amazing and still uncharted viewing that awaited. 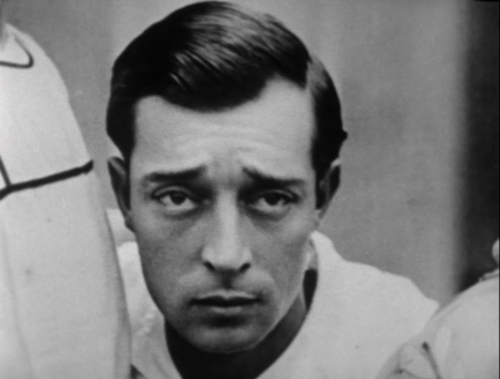 Last night's entry: Buster Keaton in "Sherlock Jr." from 1924. I do get tired trying to come up with new ways to say "this was shockingly great entertainment," because it's the sentiment I keep needing to express. "Sherlock Jr." is seriously, just really, really good. I can't wait to watch it again. The plot is sweet and clever and the artistic vision expressed is tight. A phenomenally well-made film for any era. Although we didn't find it side-splittingly hilarious, like Harold Lloyd's "Safety Last! ", this one was probably the better film for having an extremely well-developed idea which travelled with the film from start to finish, as well as enduring themes that are both charming and true. And it was funny. A delightfully complete film. but daydreams of being a great detective. He shows his mettle early on, when he finds a dollar in the pile of trash he's sweeping up. He gives the dollar to the lovely woman who comes looking for it (after asking her to "describe it"); then, gives his own dollar to another woman who has lost one; and finally, digs energetically through the pile after a third man who comes looking finds a whole wallet in the trash. At his girlfriend's house later, to which he has gone with chocolates and a proposal, he is framed for the theft of her dad's watch and kicked out of the house. In utter dejection, he returns to his job, dozes off at the projection booth, and then dreams himself into the movie! There he assumes the character of Sherlock Jr., the amazing detective brought in to solve a very similar crime -- of the stolen pearls. The scenes where his ghostlike sleepwalking self gets up and walks into the movie are phenomenal. Even by modern standards, they are evocative and clever; the camera tricks that allowed this, and the subsequent scenes where the background keeps changing on him, are fun to speculate about. These scenes are integral to showing us he doesn't really belong in that movie; he's an outsider living a fantasy. This movie within a movie allows us to explore themes of fantasy and the role of cinema magic that was taking such an important hold of people at this time and which clearly persist to this day. With Keaton playing the regular downtrodden guy in one vignette and the fabulously crafty detective in the other, he really gets an opportunity to show his charm and strengths as a performer. While Sherlock Jr. plows through the hills and streets in and around LA (on the handlebars of a driverless motorbike for a while), and while he plays pool, skillfully avoiding the ball that has been rigged with explosives, the film moves a bit like James Bond. He has all the tricks and skills and saves the lady and finds the thieves. Though a lot funnier and more bumbling than Bond, Keaton here is truly as attractive and appealing a hero. And the scenery is amazing. I wish I knew where this was filmed. (I smell an internet research project coming on). The movie's spark comes from the very intelligent themes underlying it. We all loved the ending scenes where "the Boy" is taking his romantic cues on what to do next by watching our leading man on screen; he has a priceless look of confusion when the screen characters sit holding twins." I couldn't possibly recommend this film more highly. Even to those, like me!, who do not consider themselves silent film fans, it is very watchable and entertaining. And moves as such a crisp perfect pace (at only 3/4 of an hour long) that it is hard to think of a reason not to. I´ve been reading your reviews of Buster´s movies and I´m delighted. I agree with your point most of the time and I like that you make me notice some new aspects or perspectives I hadnt seen before. Saying that, I would really love to read more in the future, and I´ll take the chance to suggest "the coat", a short included in a TV serie by Fairbanks jr.
Thank´s again for your wonderful reviews! Thank you too for encouraging me to write more. I haven't done a lot lately - as you can see; but am working on a couple more posts.